Wolfgang Amadeus Mozart’s Symphony No. 11 in D Major, K. 84. The work is believed to written in 1770, when the Austrian composer was 14 year old. For a long time, the work was considered composed by Mozart unquestionably, but its status has been challenged in 2008. Because, 19th century copies of the score attribute it respectively to Leopold Mozart (father of the composer) and to Carl Dittersdorf (2 November 1739 – 24 October 1799, the Austrian composer, violinist and silvologist). 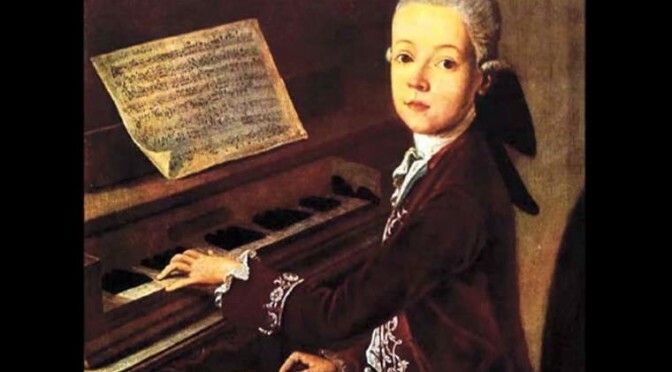 But it is still considered most likely written by the young Wolfgang: the American musicologist Neal Zaslaw, who has done extended work on the works of Wolfgang Amadeus Mozart, including a landmark 1989 work on his symphonies, wrote on the subject that: “A comparison of the results of two stylistic analyses of the work’s (Mozart’s Symphony No. 11) first movement with analyses of unquestionably genuine first movements of the period by the three composers suggests that Wolfgang is the most likely of the three to have been the composer of K73q”. The instrumentation was: strings, 2 oboes, 2 horns, bassoon, continuo.